The Mahogany Snapper juvenile has a black smudge on it's side. They are sometimes difficult to tell from the juvenile Lane Snapper. Both also have yellow pectoral fins and dorsal and pectoral fins that have a reddish edging. 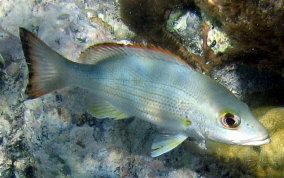 The Mahogany Snapper juvenile doesn not have the thicker, horizontal yellow body stripes. The adults are easier. 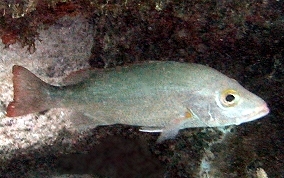 The Mahogany Snapper has the red/mahogany margin on it's tail and fins. 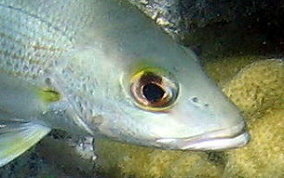 They also seem to have yellow in their eyes and brows. The larger ones I've seen have been in water at least 6 feet deep. They can get to be about a foot long.